New York, 13 October 2015 - Bullying is a serious concern for millions of children all over the world. The scale, pervasiveness and impact of bullying on children’s development and wellbeing were discussed at a side event co-organized by SRSG Santos Pais with the Governments of Mexico and Japan. The event was held during the United Nations General Assembly‘s debate on the rights of the child, which this year places particular emphasis on children’s right to education. Bullying compromises children’s rights, including the right to education. It presents special risks for children in situations of vulnerability, such as children with disabilities; children affected by migration or who are asylum seekers or refugees; children who are socially excluded; children who belong to a minority or who are indigenous. The CRC provides essential guidance to address this phenomenon recalled Mikiko Otani, child rights expert from Japan: “investment in prevention is key, starting from early years,” she noted. Data presented by the World Health Organization showed the scale and impact of bullying on children, whereas Child Helpline International shared the children’s experience and calls for help when bullying takes place. Boys are more likely to use physical violence and threats, while girls seem more prone to other forms of bullying, associated with verbal and emotional victimization. Bullying generates depression, loneliness, anxiety and low self-esteem, humiliation, frustration and anger and is associated with long-lasting consequences for children’s development. “Bullying is not just a children’s issue. There is no age limit to being a victim of bullying, and no age limit as to who the bully is. Children mirror conflicts in society. 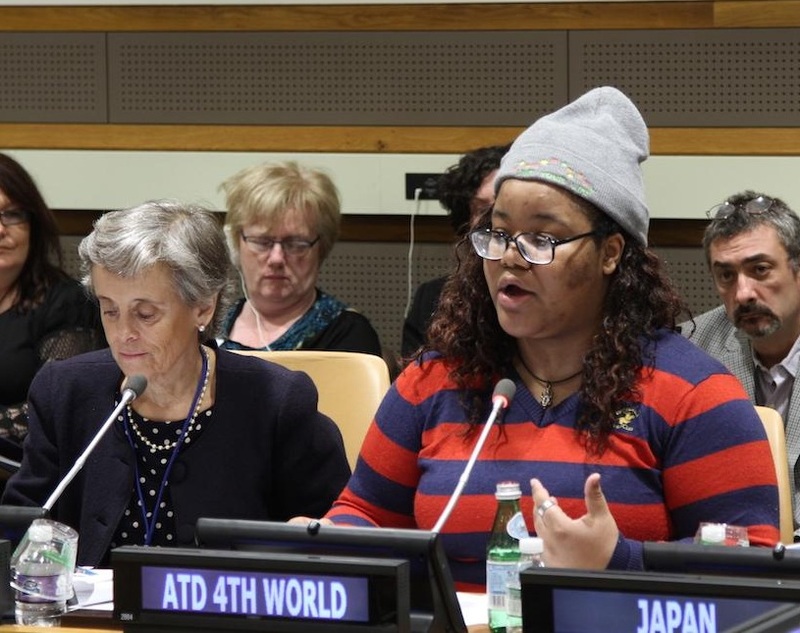 Recognizing this can save the future of many children who continue this terrible cycle because of circumstance and lack of knowledge.”stressed Kathleen Saint Amand, a 16 year-old representative from ATD Fourth World Movement. Changu Mannathoko, from UNICEF highlighted that bullying is a barrier to learning, to gain access to the full cycle of schooling from early childhood to university, “An effective strategy to eliminate bullying resides in strong investment in community dialogue including young children”, she stressed. “Across regions, more and more children use information and communication technologies at an increasingly young age. With the growing importance of social media in children’s lives, cyberbullying is becoming an increasing source of concern, placing children at risk of harassment and abuse, reaching out quicker and wider, and magnifying vulnerabilities amongst children who are at risk in the offline world. Schools have a unique potential to promote non-violent behavior promoting creative, critical, and safe use of the Internet and preventing and responding to incidents of online violence, including cyberbullying, even when they do not originate in the school environment” highlighted SRSG Santos Pais. Over the past years, several countries have addressed this important question through legislation, public policies, campaigns and research. These are all crucial elements of the integrated response to the phenomenon that needs to be promoted. “Bullying is a very serious problem and still a taboo in modern societies. Incidents remain invisible and unreported. As an Ombudsman for children, I felt the urge to bring this to the legislators’ table. The legislation introduced in the Netherlands now gives clear guidance to schools on how to prevent and respond to bullying. Ombuds can bridge national and international policy making and to close the gap between policy making and real implementation.” highlighted Marc Dullaert, Ombudsman for Children of the Netherlands and Chair of the European Network of Ombudspersons for Children. Ambassador Juan Sandoval from Mexico and Ambassador Yoshifumi Okamura from Japan called for a zero tolerance policy on bullying across regions echoing the strong political commitment around the topic. The representative from Chile pointed to the importance of addressing the most vulnerable groups. The results of the side-event will inform the Secretary General’s report on the protection of children from bullying which will be submitted to the General Assembly in 2016. The report is expected to identify major concerns, document good practices and positive experiences, and anticipate strategic recommendations to inform future action in this area. “A few days ago, the international community adopted the Sustainable Development Agenda – an agenda aiming at a world free from fear and from violence, leaving no child behind. Preventing and addressing bullying will no doubt contribute to the promotion of the safe and non-violent learning environments and to the elimination of physical, sexual and emotional violence that the SDGs seek to guarantee!” concluded Ms. Santos Pais.